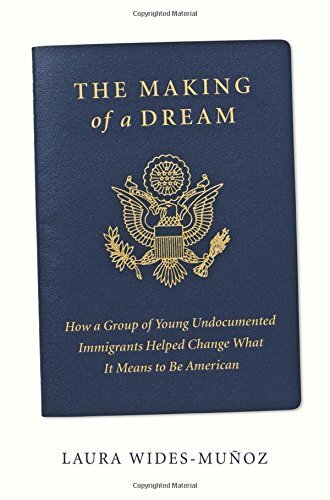 Laura Wides-Muñoz’s book The Making of a Dream: How a Group of Young Undocumented Immigrants Helped Change What It Means to Be American is out just weeks before a reported 800,000 Dreamers are in jeopardy of losing their protected status under the Obama administration’s Deferred Action for Childhood Arrivals, DACA program. Without further legislative measures to protect Dreamers, they are literally on ICE waiting to hear their how drastically their lives could be turned upside down. Wides-Muñoz, an award-winning journalist for the Associated Press, Miami Herald, has for over a decade been reporting about U.S. immigration issues and undocumented young people. She reports about the DreamACT story from its early versions when Republicans and Democrats were actually working together for comprehensive immigration reform for undocumented youth brought to this country by their parents. The book is an inspiring bio-history of these Dreamers, their journeys, and their fight for dignity and respect for their families and communities. Wides-Muñoz also unpacks an objective overview of the politics driving immigration debates in cities, suburbs, and rural towns—as well as in statehouses and key players in Washington on both sides of the aisle. Spanning two generations of undocumented immigrants, the book focuses on the lives of five young immigrants and their families who became advocates for immigration reform. Hareth Andrande came to the U.S. at age eight, just weeks before the 9/11 attacks. She was a painfully shy teen but became the face of young undocumented immigrants. She is a brilliant student and tireless activist pursuing an academic career and trying to reunite her family kept apart by technicalities in immigration law. Marie Deel came from Costa Rica to the U.S. with her parents at age five and was growing up in Missouri, a studious Midwestern girl, when her life was changed forever when ICE knocked on her family’s door. She came out of the shadows as undocumented and traveled the country as an organizer and activist. Felipe Matos Sousa Rodriguez from Brazil sought asylum as a gay youth who felt unwelcomed and imperiled in his home country. He and his lover Juan Rodriguez strategize the Trail of Dreams immigrant rights march from Miami to Washington, inspiring more immigrants to join the visible movement that brought national attention to the dual causes of undocumented youth and LBGTQ refugees seeking asylum. Dario Guerrero grew up in Los Angeles, the son of a successful businessman and his family that stayed in the U.S. after their visas expired. Guerrero won a scholarship to Harvard to study law, but became a film major and produced a documentary about generations of undocumented immigrants. Barack Obama’s election gave the Dreamers symbolic hope, and then in 2014, secured their DACA status, or so they thought. But the permanence of that program was always imperiled because it required further legislation by Congress. Now the Trump administration set an arbitrary deadline, so the fate of Dreamers was tossed to the whims of toxic partisan politics. As the countdown to the imposed March 5, 2018, deadline approaches, DACA has dominated the headlines. Politicians are reducing their lives to a bargaining chip in their political games and stoking politics with xenophobia, racism, and the divisive politics of The Other. Wides-Muñoz weaves together their personal journeys to remain in school, or join the military, keep their families together, and fulfill the requirements of DACA protections. They became part of the DREAMERs generation, and this book is a comprehensive look at the larger humanitarian movement. The Making of a Dream makes sure the voices and stories of the Dreamers will not be silenced or drowned out and brings needed perspective from those who have the most to lose while legislators refuse to do the jobs they were elected to do.